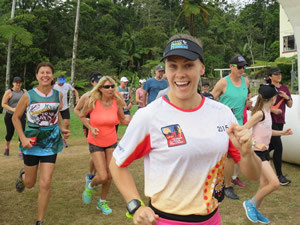 Mackay Road runners were ecstatic with the awesome attendance of the last running event on their formal 2018 program – the social Eungella Trail 6km & 12km run. Race Director, Matt Stevens briefed approximately seventy runners across both events on the course description and safety guidelines to assist their trail running experience. Under perfect Eungella skies, the 21km and 6km runners bolted from the gates at 8am and 8:10am respectively, heading towards the beautifully maintained trails and canopied rainforests. 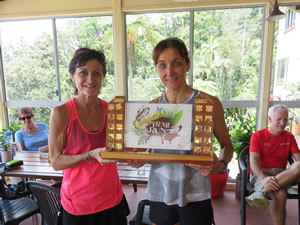 The 21km Eungella Trail Run perpetual trophy went to first placed male and female, Rod LeCoz and Kaylene Gardner. Rod’s excellently paced race saw him finish nearly five minutes clear of second, with third placed Andy List easily handling the tough pace. Talented athlete, Kaylene performed extremely well in her first ever trail run, scorching over the testing course which included many serious undulations and tight meandering turns. The second placed female was only two minutes in deficit, with Lauren Dunne powering across the finish line for the bronze medal. 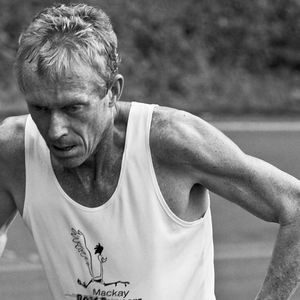 Shane Potts displayed outstanding speed and agility, smashing the six kilometre field ahead of Darrin Pullen, Ross Connor, Andrew Short, Wayne McMurtrie, Craig McGahey, Lachlan Stevens, Matt Stevens and Mark Takagaki. Leon Ryan and his family put in an awesome performance, easily sprinting up the trails to the turnaround marker and downhill to the finish line. Janelle Tilse was rapt with her run, scoring first place for the girls, three minutes clear of silver and bronze. All runners are to be congratulated on their amazing efforts, most coming away with a few minor scratches and bruises from negotiating rocks, tree roots, wildlife and ‘wait a while foliage’ that is part of trail running and what makes trail running so much fun. Those who challenged and conquered the event included Greame Harris, Tim Caddy, Mark McFadzen, Martin Lambert, Cilla Martland, Jeanette Farrugia, Kim Saron, Jo Hughes, Leanne Connor, Ange Furdek, Cath Meng, Karen Pullen, Peter Shuttlewood, Brianna Mouat, Peter Goodworth, Rebecca Blines, Gaven Porter, Jason McCord, Carol Brown, Brenda Windsor, Simon Henderson, Tim Magoffin and Jarred Spence. Many thanks to the Eungella Chalet, Financial Linx, Zambrero’s, Ace Panel & Paint and National Parks & Wildlife for their ongoing support of the event….so much appreciated. Many thanks also to Race Director Matt Stevens, Tim Magoffin and their families together with race set up expert, Andrew Short and Geoff Neale for their sensational assistance and organisational skills for making the event such a success.